Grant is 11 years old. He has hypertonic Cerebral Palsy as a result of a lack of oxygen at 12 hours old. Grant's cognitive level is between 3-4 Years. He uses a walker or wheelchair to get around in the community, at home he crawls. 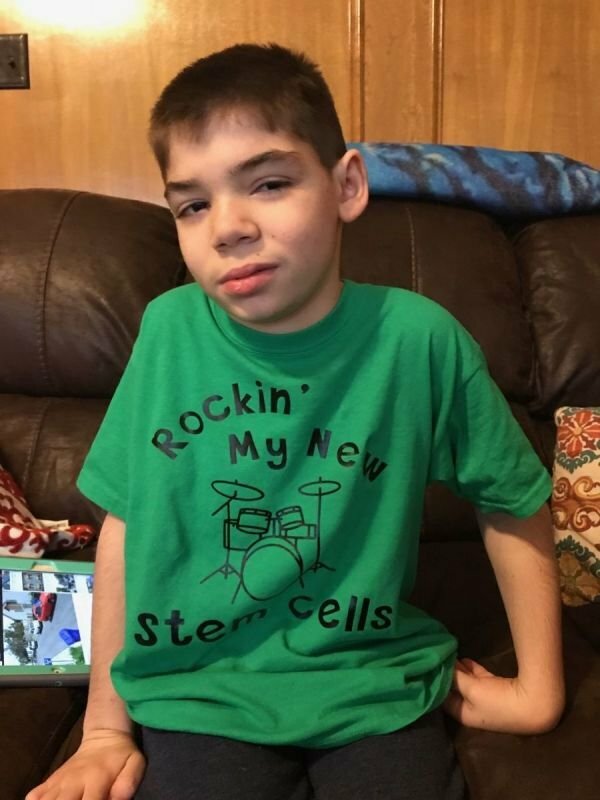 Grant has 4 different types of seizures, Cortical Visual Impairment (CVI), bronchpulmonary dysphasia, a feeding tube where he receives feeding treatments and meds. He takes 11 meds a day 4 of those are for seizures. Grant is unable to do daily tasks such as feeding, dressing, bathing, getting to the bathroom...etc. Grant shakes all the time and has trouble with both fine and gross motor skills. In September of 2018 we traveled to Panama City, Panama to the Stem Cell Institute owned by Southlake Texas Dr. Riordan where Grant received 60 million stems cells via IV over the course of 4 days. The stem cells Grant received are called Mesenchymal cells and are from donated umbilical cord blood. At the time we went to Panama Grant was having 8-12 seizures on average every single day. These seizures cause a huge risk to him as he grows stiff and Falls over. He has received sutures numerous times. Our hopes in stem cell treatment is to reduce/eliminate seizures, improve cognitive, gross and fine motor skills. Within 2 weeks of Grant's first treatment his seizures were greatly reduced. He has had a total of 24 seizures since September which we consider a huge success and blessing. Grant's constant shaking in his hands and legs has been reduced to only occasionally when he is working in Physical and Occupational therapy. For the first time in his life he removed his own shirt Completely unassisted. His cognitive skills have dramatically improved. He stood on his own during therapy. We will be returning to Panama in March for a second round of stem cells. We have been told by parents that have traveled this road before us that the more times he can get the treatment the bigger gains we will see.